May the joy of the Risen Christ be with you! In April, Loyola Academy hosted the ninth annual Jesuit National 4x5, a hybrid art show and competition that requires all entries to be just four inches by five inches. The competition is open to all Jesuit high schools and awards prizes in categories such as color drawing, black and white drawing, printmaking, digital design, mixed media, sculpture and more. On Sunday, April 7, more than 200 parents and students gathered for Loyola’s annual Family Mass and Day of Service, sponsored by the Mothers’ Club, Fathers’ Network and Campus Ministry. Loyola Academy President Rev. Patrick E. McGrath, SJ, presided over Mass, delivering an inspirational homily about forgiveness, empathy and understanding. Members of the Class of 2022 set out the morning of Monday, April 1, to dozens of volunteer sites across the Chicagoland area for Loyola’s annual Freshman Day of Service. “The purpose of the day is to immerse our freshmen in the mission of Loyola Academy and to remind them of the importance of being women and men for others,” said Campus Minister Mr. Lyle Baier, who organized the day. 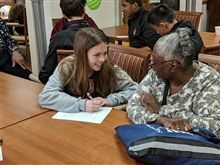 Loyola Academy’s annual Solidarity Project (April 1–17) kicked off with a comprehensive Workshop Day on Monday, April 1. Sophomores, juniors and seniors had the opportunity to hear from two keynote speakers and choose three sessions from nearly fifty workshops that addressed this year’s theme: Capturing the Power of Technology.